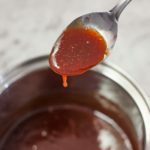 This Keto Sweet and Sour Sauce recipe is a Quick and Easy way to add that "Authentic Chinese" restaurant style taste to your Low-Carb Asian meat dishes. Place all the ingredients except the xanthan gum in a saucepan and place over medium heat. Sprinkle the xanthan gum into the saucepan and bring the sauce to a simmer. Simmer the sauce, whisking occasionally until it has thickened enough to coat a spoon. Remove from the heat and serve immediately or chill to use as a dipping sauce.